If the bombs went off, the Domes would die—and so would every man, woman and child in them. With a mile or more of sea water pressing down, even a near miss would do the job. And the Domes—vital sources of the minerals needed to keep Earth’s civilization going—were the most tempting targets in the war that threatened to break out any minute! Danial Mason, Manager of Wilmington Dome, didn’t want to die. But there was only one way to avoid it—stop the war before it started! Before I started this book, I wasn’t sure whether it would be set in space or underwater. Sure, the tagline at the top talks about “War in the depths,” which I should probably have interpreted as meaning underwater, but “depths” could refer to the “depths of space,” couldn’t it? The cover art doesn’t help, really. That could be a dome protecting people from space or from water. And that thing in the front? That could be either a rocket or a submarine. I think it looks more like a rocket than a sub, personally, but I guess it makes more sense for a sub to be shaped that way. A rocket doesn’t need to be rocket-shaped unless it’s got an atmosphere to worry about, and if there were atmospheres to worry about, they wouldn’t need bubble domes. I guess the atmosphere could be made of methane or something, now that I think about it. So it still stands. This book could be about either. The reason it tortured me so is because, for some reason that I do not yet understand, I do not like stories that take place under the ocean. It’s not a rational thing. I don’t have any explanation to put forward. That’s just how it is. They make me feel tired. This was true of the other two underwater books I’ve reviewed, although I’m not sure if I commented on it at the time. “Does this apply to books that take place on top of the water?” I hear you asking. And the answer is no, it does not. Boats are fine. I recently started reading the Horatio Hornblower books and I’m hooked. Submarines make me feel fatigued. But anyway, this book takes place underwater in bubble domes. There are submarines and strong libertarian overtones. The book predates Heinlein’s The Moon is a Harsh Mistress by a few years, but there were some similarities. 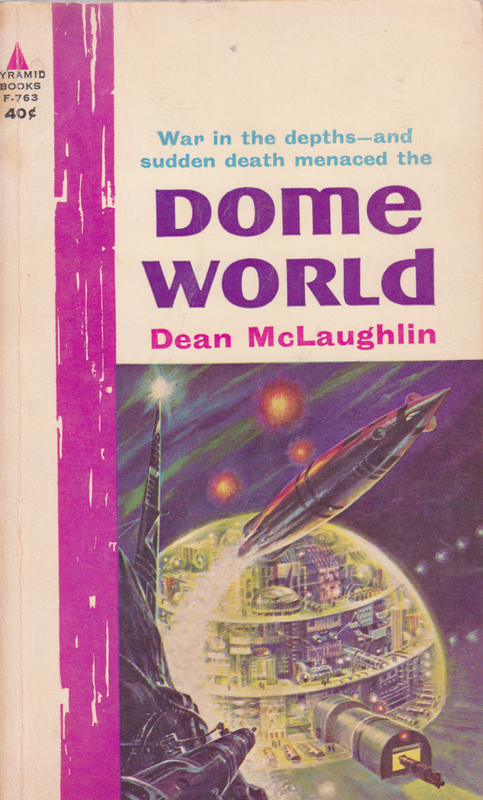 Unfortunately, whereas Heinlein’s book had cool things like a sentient computer and asteroids dropped from lunar orbit, Dean McLaughlin gave us a book with submarines and bubble domes and no story to speak of. And it did that twice. The back of the book doesn’t say anything about this book being two books. This is a thing I’ve seen a lot of recently, and it bugs me. Often it comes from a book being adapted from a shorter work, probably a story. This is the case with Dome World. It points out that the book is an extended version of a story that appeared in Astounding in 1958. In these cases, it feels like the author wanted to expand upon an idea from an old short story, either for creative or monetary reasons, and figured the best way to do that would be to tack on another section to that story instead of expanding on the story itself. Part one is what we’re told about on the back cover. Yes, the character’s first name is in fact “Danial,” which just looks weird and I don’t like it. It looks like a typo. Maybe at one point it was. Danial Mason isn’t much of a character. He’s got one, maybe two traits. He cares about the people in his charge at Wilmington Dome, and he’s tired all the time. Before taking over operations at the dome, he lived on the moon, and he’s not yet adapted to Earth’s gravity. Plus he’s under a lot of stress lately, what with imminent death and all that. So there’s a war about to brew. It has to do with underwater mining rights. The bottom of the ocean is increasingly populated with bubble domes, which are used for mining and manufacturing operations. It seems that the chief purpose of the domes is to create the materials for more domes. I guess they also supply the people on the land, but that seems secondary. The war is between the American continent and the African one. At some point the nations on those two continents got together and formed really big countries. Something I thought was neat: the capital of the American continent is in Panama. On the other side, things are run by Johannesburg, I think. The capital of Africa is definitely somewhere in South Africa. So both of these superpowers have underwater domes, and there are strict rules about where national boundaries lie under the water. Recently, however, a supply of vanadium was found, and the rules are being contested and flouted. So there might be war. The problem Mason has with this is that all the bubble domes are fragile. All it would take is a single (thermonuclear) bomb to crack one, and after that it’s all over. Since the domes are basically the front lines of a potential war, this is worrisome. So Mason’s big plan, which finally happens after about seventy pages of wandering around, being tired, and talking, is to declare independence. He makes the dome its own sovereign nation and then reaches out to all the other domes, American and African both, to do the same. Then they join together in a league (called The League), and threaten to boycott the mainland if hostilities cause damage to any of the domes. Since the whole point of the war was the domes anyway, this solves the problem. And then we cut to the future. It doesn’t actually say how far into the future we go. Or maybe it did and I missed it. There was a lot going on in this book. It was very densely worded. Skipping a sentence would throw me off entirely, and skipping sentences is just something that happens with me. I’m not proud of it. I’m sure I’ve missed some very enlightening passages over the years, but when books are good I tend to re-read them anyway and I manage to catch the bits I missed. I learn something new every time I re-read my old favorites. I am a strong advocate of reading things over and over. A book with something good to say is a mine of joy that can’t be exhausted after one go. Reading about Mason’s Declaration of Independence, the ramifications of it across the world, and how he struggled to make it happen in a humane and peaceful way would have been a more interesting book. But it skipped that part, and we barely even hear about how things went. We just get the result and learn that a few places have been named after him. So Macklin is in basically the same boat that Mason was in. There’s another war brewing. He’s not as tired all the time as Mason, but he’s also got a problem. His heart might give out at any moment. I’m curious about this decision. Both characters have a physical flaw that would, under most circumstances, rule them out from making big decisions and making them happen. But they persevere anyway. You might even say they pick themselves up by their own bootstraps and show what a flawed but competent man can do when put to the test. This, my friends, is Libertarian Science Fiction. Macklin’s war is between the “Mainlanders” and the League. America and Africa have put aside their differences to concentrate on the fact that the underwater people are the real problem. That problem seems to be that independence really suits them and looks very attractive, which makes the land-based governments nervous. They’ve built their own domes in the meantime, but they have to keep them under a tight fist to make sure that they don’t go the way of Mason’s revolution. The other problem is that League members have found a way to make personal domes, so people are basically homesteading the ocean floor. This presents problems when it comes to boundary control and the mainland governments are concerned that eventually the League will be able to claim the entire ocean floor. A war would be disastrous in much the same way it would have been in the first part of the book, although slightly less so because of the Suburban Bubble Dome Boom. The mainland-controlled domes do not allow suburbanization, so if war happens, it’s worse for them. Macklin doesn’t want that to happen either, though. He’s actually a good guy. Macklin attempts to negotiate with the land-based governments but the talks don’t work. While that’s happening, his daughter is dating this guy and they’re thinking of getting married. The problem there is that his daughter is a citizen of the League while the guy she wants to marry is a Mainlander. Macklin goes to talk with the guy’s parents, who seem very decent, and everything looks to be okay, but for reasons I didn’t quite get some guy tries to arrest him as he leaves. Macklin’s heart gives out but the defibrillator in his chest kicks in, saving him. It’s kind of neat that he’s able to take this cop down while in the middle of a heart attack, though. So Macklin’s bathtub has an autopilot. (That was fun to write.) He just needs to plug in latitude and longitude and it’ll go right there. The problem is that he doesn’t know the coordinates for his home dome. So here we’ve got an interesting little bit of science fiction technology. Macklin has the tech for a computer to autopilot his submersible to a dome miles beneath the ocean. But that computer is lacking a few things. McLaughlin missed the boat (haha) on tech like GPS or a spreadsheet of all the domes and their coordinates that would seriously be like four kilobytes. So with a map hand-drawn from memory and a lot of guesswork, he manages to find a dome. It turns out that it’s not his, but rather one belonging to America. Seriously, the computer didn’t even have a map? A .jpg with little pushpin icons would be the easiest thing in the world. Macklin sneaks into the dome and almost gets arrested again, this time for something that I actually saw happen and made sense. He was trespassing. Sure. Instead of going to jail, he goes to the hospital, because after all he had a heart attack several days ago. Once he’s on his feet again, he calls up a guy he knows who lives in this dome. They’ve talked before. They’re pals. I think this time we’re told how long it’s been. Two years, I want to say. I might be wrong. Anyway, all this whole thing is, and we’re in the last couple of pages of the book now, is a little vignette telling us what Macklin’s idea was and how well it worked. All it was was a city, guys. A free city of personal bubble domes, with no centralized bubble dome to run things. There’s this bit of talk about how governments don’t work to help people and stuff like that. And then Macklin muses on what it means to be a hero (he doesn’t think of himself as one, but everyone else seems to). And the book ends there. The more I age, I get less enthralled by stories about capable men doing capable things. There’s still a part of me that likes them, just because I like the idea that a person could actually enact some change in his or her lifetime, but I also recognize that it’s more or less a fantasy. The fifties and sixties fetishized the notion. Heinlein was probably the most noteworthy of the lot, but this book was right up the Admiral’s alley. At least Heinlein has other things to bring me back in occasionally. This book did not. But I wonder if I would have felt differently a decade ago, when I kept a copy of The Notebooks of Lazarus Long at hand for easy reference. I still haven’t figured out why underwater stories turn me off so much. I like the idea, I honestly do. I’d love to see a world where we were able to safely and ecologically harness the vast riches beneath the ocean. Of course, this book didn’t have anything to say on the ecological topic, but there you go. If I could have sufficient guarantees about safety and survivability, sure thing I’d move to the ocean floor. And yet stories about it bore me. Why is that? I’m often amazed how books of that era would be like 75 pages long, and despite that, would be fix-ups of three shorter and unconnected stories. It’s weird. Scary book. shows the impending doom of an apocalyptic world. rare story. like the series, there are some other really interesting stories in this book series can’t remember the names….